This sturdy wall mount lets you adjust the directionality of a Bose® Panaray® 402® Series IV speaker, with up to 30 degrees of tilt, and 90 degrees of swivel. This weather-resistant model is suitable for indoor and outdoor installations. 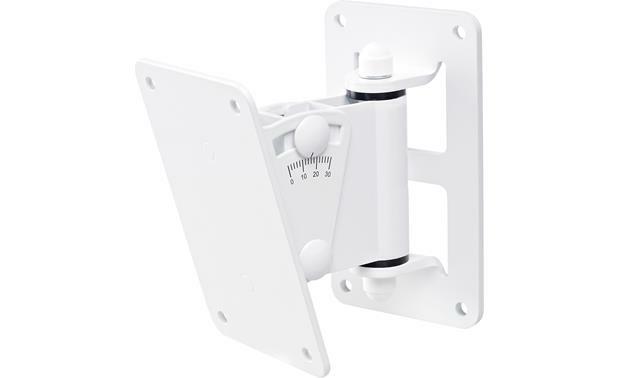 Overview: The Bose WBPWR-50 Pan-and-Tilt bracket was designed to wall-mount Bose's Panaray 402 Series IV, F1 Model 812, RMU105, RMU108, RMU206, and RMU208 loudspeakers, either indoors or outdoors, allowing up to 30˚ of tilt and 90˚ of swivel. The bracket also features a convenient "hook-and-lock" mounting method, where half of the bracket mounts to the speaker while the other half gets mounted to the wall, allowing the speaker to simply rest on the wall piece while tightening the mounting bolts. Searches related to the Bose® Outdoor Pan and Tilt Bracket Surface-mount bracket for Bose® Panaray® 402® Series IV speaker.